The Ketron PEEK family of materials is based on polyetheretherketone resin. This semi-crystalline advanced material exhibits a unique combination of high mechanical properties, temperature resistance and excellent chemical resistance making it the most popular advanced plastics material. Ketron 1000 PEEK stock shapes are produced from virgin polyetheretherketone resin and offer the highest toughness and impact strength of all Ketron PEEK grades. Both Ketron 1000 PEEK natural & black can be sterilized by all conventional sterilization methods (steam, dry heat, ethylene oxide and gamma irradiation). Additionally, the composition of the raw materials used for the manufacture of Ketron 1000 PEEK stock shapes complies with the regulations of the European Union (Directive 2002/72/EC, as amended) and the United States of America (FDA) for plastic materials and articles intended to come into contact with foodstuffs. 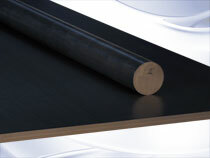 Ketron 1000 PEEK natural and black (rods, plates, tubes) are available as "Food Grades". This 30% glass fiber reinforced grade (colour: brownish-grey) offers a higher stiffness and creep resistance than Ketron 1000 PEEK and has a much better dimensional stability. This grade is very appropriate for structural applications carrying high static loads for long periods of time at elevated temperatures. The suitability of Ketron GF30 PEEK for sliding parts, however, is to be carefully examined since the glass fibers tend to abrade the mating surface. This 30% glass fiber reinforced grade offers higher stiffness and creep resistance than Ketron LSG PEEK and has a much better dimensional stability. Ketron LSG GF30 PEEK blue stock shapes have also been successfully type tested for their compliance with both United States Pharmacopeia (USP) and ISO 10993-1 guideline requirements for Biocompatibility Testing of Materials, and they come with full traceability from resin to stock shape. These features, added to an excellent sterilizability by means of steam, dry heat, ethylene oxide, plasma and gamma irradiation, make Ketron LSG GF30 PEEK blue stock shapes very suitable for applications in the medical, pharmaceutical and biotechnology markets. This 30% carbon fiber reinforced grade (colour: black) combines even higher stiffness, mechanical strength and creep resistance than Ketron GF30 PEEK with an optimum wear resistance. Moreover, compared to unreinforced PEEK, the carbon fibers considerably reduce thermal expansion and provide 3.5 times higher thermal conductivity - dissipating heat from the bearing surface faster, improving bearing life and pressure-velocity capabilities. This 30% carbon fiber reinforced grade combines even higher stiffness, mechanical strength and creep resistance than Ketron LSG GF30 PEEK blue with an optimum wear resistance. Ketron LSG CA30 PEEK stock shapes have also been successfully type tested for their compliance with both United States Pharmacopeia (USP) and ISO 10993-1 guideline requirements for Biocompatibility Testing of Materials, and they come with full traceability from resin to stock shape. These features, added to an excellent sterilizability by means of steam, dry heat, ethylene oxide, plasma and gamma irradiation, make Ketron LSG CA30 PEEK stock shapes very suitable for applications in the medical, pharmaceutical and biotechnology markets. Ketron LSG PEEK stock shapes (colours: natural, black) are produced from selected batches of PEEK polyetheretherketone resin. This material exhibits a unique combination of mechanical properties, temperature and chemical resistance. The composition of the resin used for the production of the Ketron LSG PEEK stock shapes complies with the regulations that apply in the Member States of the European Union (Directive 2002/72/EC, as amended) and in the United States of America (FDA) for plastic materials and articles intended to come into contact with foodstuffs. Ketron LSG PEEK stock shapes have also been successfully type tested for their compliance with both United States Pharmacopeia (USP) and ISO 10993-1 guideline requirements for Biocompatibility Testing of Materials, and they come with full traceability from resin to stock shape. These features, added to an excellent sterilizability by means of steam, dry heat, ethylene oxide, plasma and gamma irradiation, make Ketron LSG PEEK stock shapes very suitable for applications in the medical, pharmaceutical and biotechnology markets. The addition of carbon fibers, PTFE and graphite to virgin PEEK results in a Ketron PEEK "Bearing Grade" (colour: black). Its excellent tribological properties (low friction, long wear and high pressure-velocity capabilities) make this grade especially suited for wear and friction applications. This member of the Ketron PEEK family (colour: blue) has been developed especially for the food industry. Like Ketron 1000 PEEK, this new internally lubricated material has a food contact compliant composition, but offers far superior wear and frictional performance, making it expecially suitable for a wide variety of bearing and wear applications in the 100 to 200°C service temperature range. Ketron TX PEEK (rods, plates) is available as a "Food Grade". Ketron CLASSIX™ LSG PEEK stock shapes are produced from Invibio® PEEK-CLASSIX White resin. This material exhibits a unique combination of mechanical properties, temperature and chemical resistance. The composition of the Invibio PEEK-CLASSIX White resin complies with the regulations that apply in the Member States of the European Union (Directive 2002/72/EC, as amended) and in the United States of America (FDA) for plastic materials and articles intended to come into contact with foodstuffs. Ketron CLASSIX™ LSG PEEK stock shapes have also been successfully type tested for their compliance with both United States Pharmacopeia (USP) and ISO 10993-1 guideline requirements for Biocompatibility Testing of Materials, and they come with full traceability from resin to stock shape. These features, added to an excellent sterilizability by means of steam, dry heat, ethylene oxide, plasma and gamma irradiation, make Ketron CLASSIX™ LSG PEEK stock shapes very suitable for applications in the medical, pharmaceutical and biotechnology markets. The stiffness of all PEEK grades drops off significantly and expansion rate increases above its glass transition temperature (Tg) of 150 °C (300 °F). A material like Duratron® PAI would be better suited for close tolerance bearings or seals operating at temperatures higher than 150 °C (300 °F).